lagos police barracks on fire this afternoon. 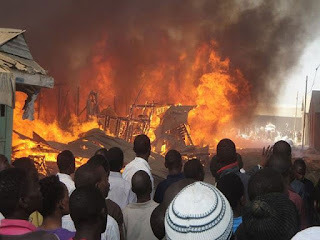 About 24 flats at the police barracks behind the State Department of Criminal Investigation, Panti, Yaba, Lagos, were destroyed in a fire incident on this afternoon. 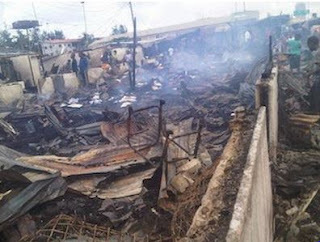 The fire outbreak which the cause is yet to be realised injured one person and caused a lot o damage to the barracks as an habitat for humans, not neglecting the fact that the landscape was not spared leaving the burnt area with a description of shades of black an unpleasant architecture. 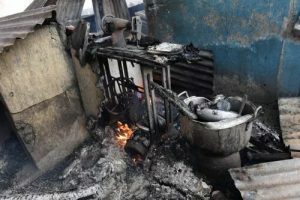 According to residents of the block of flats, the injured man who was sleeping at the time of the incident got some serious burns on his body and was now in hospital, and fire eliminated so to say household items including stoves, fridges, and television sets where no left behind. According to sources, the fire fighters where embarrassed cause at the time they got their, the outburst and combustion of the fire was now over... that is bad. Pls we need more efficient emergency units in Lagos, or what your say about that??? ?